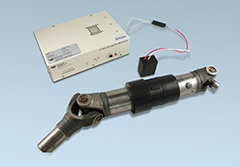 Teledyne Instruments - Test Services (TTS) offers a unique Automotive Torque testing tool, the RT100D Torque Sensing System, designed for long term in-vehicle or dynamometer testing. No outboard wiring or slip rings are required. The RT100D is entirely weatherproof making it an excellent choice for fleet testing. The RT100D uses non-contact, data transfer technology providing the user with a clean and responsive signal. Power is supplied to the rotating collar inductively eliminating the need for batteries. The RT100D is truly a “hands off” torque measurement system, as once installed, it is invisible to the user. TTS offers this exciting product as a turnkey installation onto the customer’s driveshaft. Physical size (LxWxH): 9.0" x 4.1" x 3.1"